Trigger warning: This post discusses feminine hygiene products. While I was in Florida, I made many Walmart trips. Because you always forget something. On one of these trips I was picking up razors. I was about to buy my regular brand when I thought I’d check out the guys’ razors. My finances could use some shoring up, so I’ve tried to be conscious about exercising a bit more frugality. And the guys’ razors are always cheaper. Except this time, they weren’t! My jaw hit the floor. The Pink Tax in reverse! Two similar products, same brand. One clearly marketed to women, the other to men. I’ve tried both, and they both successfully get the hair off my legs. It’s the packaging you’re paying for. 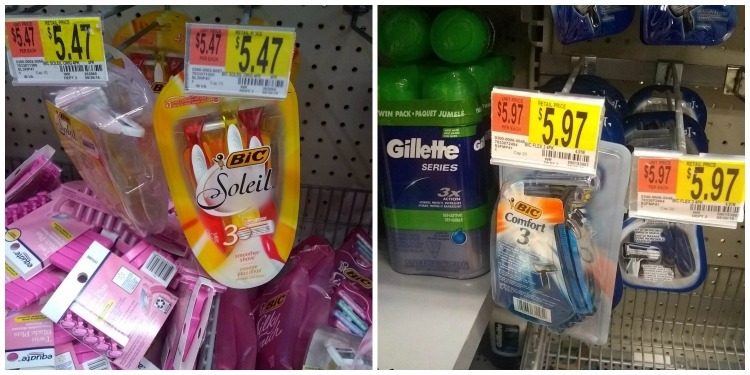 Normally, the women’s razors would be more expensive than the men’s, but for whatever reason, on this day in this particular location men’s razors were more expensive. So this anomaly was exciting. But then I came home and found that the Pink Tax has been working its regular magic at all the area suburban stores I’ve shopped at since. In fact, Friday night I was shopping in preparation for Snowmaggedon. I was buying razors, and went through a similar thought process to the one I experienced at that Floridian Walmart. Wait! Bad! Buy the cheaper men’s razors! Wait, wait, wait. Remember that commercial that made you feel like maybe there are some good people in the world after all? And how at least some Twitter bots are protesting because apparently they don’t want a society that’s safe for women and children? Because that’s a platform now? Buy the Gillette razors. They used their platform for good. And, yes, to appeal to Gen Z for advertising purposes. But you know what? Nope, that ish is still expensive as hell. So obviously I’ve had a lot of deep thoughts about razors lately. I’d like to look at the financial issues and psychological economics behind these thoughts I experienced. First there’s the Pink Tax. It’s this thing where women’s products cost more than men’s, even when they’re identical products only differing in presentation, which is gender-binary-oriented. Razors are obviously an example. So is shampoo. The list goes on. If it’s marketed to men, it’s cheaper. Perhaps the logic behind it is that women are more eager to be beautiful because that’s how society values them so they’re willing to invest more money into “beauty” products which are really just a part of basic hygiene. But that logic makes me want to throw up in my mouth. The Pink Tax is also a problem when it comes to feminine hygiene particularly. I live in the great state of Pennsylvania, where we’re not taxed on things like food and other necessary items like basic clothing. You know what else we don’t pay tax on? Also known as feminine hygiene products. No one buys tampons because they like the way they feel. These products are not luxuries. We buy them because they are necessary to function in the day-to-day world. They’re necessities. Just like food. Just like basic clothing. Yet many states still tax them. I’m kind of crazy and think that not only should they not be taxed, but they should be a fully-covered benefit of any ACA-compliant plan. And that same coverage should be mandated as a contingency of granting states Medicaid funding. Am I a sucker for advertisers? Yes, I did exactly what these advertisers hoped their commercials would influence me to do. I bought their product because of their moral stance. Gen Z is coming of age. You can officially stop calling 18-year-olds millennials. I’m in my 30s now, and I’m pretty close to the middle of the pack. Gen Z is the hottest new target audience, and they lean liberal. They take note of things like social positions of companies, and they truly do vote with their dollars. Millennials do this to some extent. Obviously. I bought into the razor ad. But I think Hasan Minhaj does a good job of exemplifying the effects of millennial anxiety on our final spending decisions. I’d recommend watching the whole thing, but you’ll pretty much get the point I’m trying to make if you watch to 1:40. Note: We’ll be talking more about millennial anxiety and its effect on our personal economies in coming weeks. You can subscribe here to get a notification when the post goes live. So I bought a product because the people in their marketing department were smart enough to prey on my sense of morality. Does that mean I’ve been duped? I’m of the opinion that it doesn’t. Now, it may have been a bit irresponsible of me to not research if Gillette as a company has any skeletons in their closet before I made the purchase. But given the information I had at the time, I’m happy with the decision. Really I think we just need to talk about these things and accept that sometimes our individual actions or opinions may be wrong. For example, with retrospect I can see that I should have researched the company via actual news sources to see if my values aligned with theirs or not. This rather than relying on an advertisement put together by marketing professionals. They hit my values on the nose in that ad. But do they exemplify those values after I give them my money? They very may well. The marketing department may have had only the greatest of intentions as they crafted this ad that made me cry. The company may very well live up to these values. I haven’t heard anything to the contrary. I couldn’t immediately find anything disturbing about the ad like I experienced with that terrible Pepsi commercial a year or two back, either. But because it is coming from an advertising department, it’s not necessarily a reliable source to represent the actual company culture. 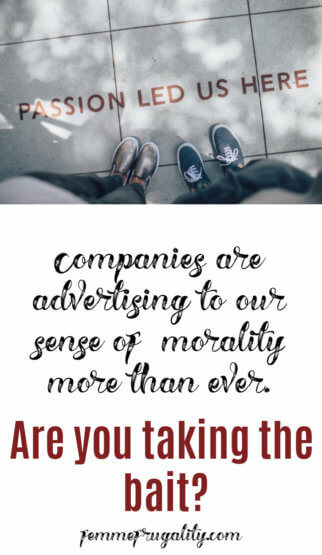 If we don’t openly talk about our values and the way we digest media when those are the very things advertisers are targeting, we will cease to be informed consumers. In the meantime, if anyone has an inside scoop on the work and company culture at Gillette, lemme know. Until I have information that changes my mind, I’m going to consciously allow myself to be swayed by this brilliant marketing campaign. This entry was posted in Money Management, Think on January 21, 2019 by femmefrugality. Meet Clint. Clint is the CFP behind NextGen Wealth. I’m in my 30s, so I was anticipating reading this article myself. Give it a good read–there’s a lot of information to think on in here! Many consider your 30s to be the “real” adulting stage. It’s when you really start to develop a sense of responsibility and strategy on how you will live your life in the next couple of decades. That’s why it’s absolutely crucial that you identify and apply solid money-management principles during this time. Here are five ways you can secure better financial health for today and in the future. What’s the best way to hit your financial goals faster? Earn more. And to earn more, you have to be the best guy for the job. How to do this? By continuously learning. Develop your skills and add new ones. Volunteer or sign up for training and seminars. Get certified, expand your skill set and branch out to other related disciplines. Companies reward people who are great at what they do. And, even if you don’t get promoted during your stay there, you’ve increased your market value and will now be in a position to demand better pay on your next job. If you can’t get promoted or get a pay raise, why not get a side hustle? For a few hours a week, you can earn some extra money and build up your assets faster. Job marketplaces like UpWork and Fiverr are quick ways to get started. And, there are specialized talent marketplaces to discover that can pay better depending on your specialization. The lesson? Make better use of your time. Not only do you earn extra, but you also develop your freelancing skills. How do you avoid debt? Simple: Don’t buy stuff you don’t need. You’ll be surprised to learn that many of the things you own are spur-of-the-moment purchases triggered by dopamine. Let’s face it, there’s always that “shiny new thing”. Apple will never stop selling new iPhones every year. Amazon is a rabbit hole that will take away precious money and hours of your day if you let it. Automate your payments for credit cards and bills. Prioritize high-interest debt and set aside a fixed amount for payment on a regular basis. Why do this? Setting up an automatic system reduces friction in terms of paying debt on time. This mindset applies to the opposite end of the spectrum. If you want to purchase something (discretionary expense), use cash. Using cash increases the friction of parting with your money, simply because the very act of handing over physical bills make us “feel” the loss more. Think about it, why do you think Apple Pay and Amazon One-click were implemented? Efficiency and convenience? Sure. But it also reduces the effect of what psychologists call “coupling”, which states that the value of experience from a product/service is tied to the act of paying for it. So if you opt to pay with cash for the latest iPhone, you’ll feel the crunch more because you part with your money right away. The experience brought about by owning a new phone is directly linked to how you pay for it. Used strategically, you can discipline yourself to avoid unnecessary purchases which lead to debt. It would be unwise not to take advantage of your employer’s 401k plan. Tax benefits, employer matching, access to loans, and protection of funds from creditors are just some of the benefits of having a 401k. If you can, set up a Roth IRA too. You’ll have tax-free income during retirement and also have the option to withdraw funds during times of need. You should also consider getting a health savings account when possible. Here are some of its benefits: Pre-tax contributions, tax-free withdrawals and earnings, portable, and provides you with funds for medical purposes. What’s the point of utilizing these investing tools? As you reach your 30s, your income will generally be higher than when you were starting. New skills, promotions, and accumulated job experience should have increased your market value and your potential income along with it. It’s the best time to start saving for the future. Don’t spend it on stuff that doesn’t provide value in the long run. Instead, invest it and let it grow to build yourself enough assets for the future so you can achieve your goal of financial freedom. Start by making a weekly/monthly budget. Identify your discretionary and non-discretionary expenses. Track your spending. You’ll be surprised how much you spend on things when you start to track them. Set budget goals and reward yourself when you hit them. For example, you can treat yourself to a movie if you were able to skip Starbucks for a week. This way you won’t feel deprived and actually look forward to saving since there’s a reward when you accomplish it. By being conscious about our spending, we stop acting on emotions alone which is the number one reason why people spend too much. Automate your savings and payments. Use cash for discretionary expenses. Always be conscious when it comes to spending. Make sure that it fits your budget and aligns with your goals. Picture this: You realize you want to take better care of your health and decided to sign up for a gym. The first time you enter, you see all sorts of equipment. Barbells, elliptical machines, treadmills, kettlebells—Where to start? If I wanted to build the muscles on my upper body, which type of training should I focus on? What if I wanted to focus on losing weight? Which machine and exercise are perfect for achieving that goal faster? What do most people do when faced with this dilemma? That’s right—approach and seek help from a personal trainer. When it comes to building your financial muscles, the same principle applies. Deciding to be financially-fit is the first step. You’ll improve a lot simply by applying the tips we mentioned above. But what if you want to take it to the next level? What if you want to reach your goals faster, make sure you’re doing the right things and moving in the right direction? Like gym instructors, financial planners help you pick the right tools and advise you on the strategy to take for a specific financial goal. Instead of trial and error, you get to start on the right path immediately. Like a gym coach, a financial planner is someone who gets you on the right program so you maximize the use of your time and energy (in this case, your money) and reach your targets faster. 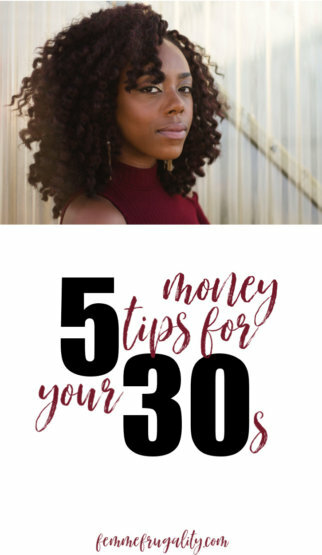 This entry was posted in Money Management on December 19, 2018 by femmefrugality. I received product in exchange for my honest review. All opinions are 100% honest and my own. You guys know I’m not prone to spend inordinate amounts of money on everyday items. My value-based spending just doesn’t lend itself to the materialistic. I’ll spend on travel, even while finding ways to make it super cheap, because I know the memories and the expansion of my worldview are worth it to me. On the other hand, I have been known to seriously skimp on things like clothes, shoes, toothbrushes, entertainment, etc. One time my frugality got so bad that I did something totally inappropriate that could have been solved with wrapping paper. Not spending money is kind of my thing. But there is one area of home decor where I’m decidedly unfrugal. And that, my friends, is my bed sheets. In the past, I’ve started my sheet shopping sojourns at the place all frugal shopping trips begin: Walmart. I begin my lament by asking why all the dang sheets are polyester. I scour the shelves to find the only Better Homes and Garden set that is actually 100% cotton. I get it home and am proud of myself. No sweating in a pool of polyester nightmares. Just cotton goodness. I grab the same pillow I’ve been clinging to for years and drift off into dreamland. Then a month later a kid is scooching onto or off of my bed and the fitted sheet rips. Or I’ll find the tear when I’m pulling it out of the dryer. And the whole process starts over again. 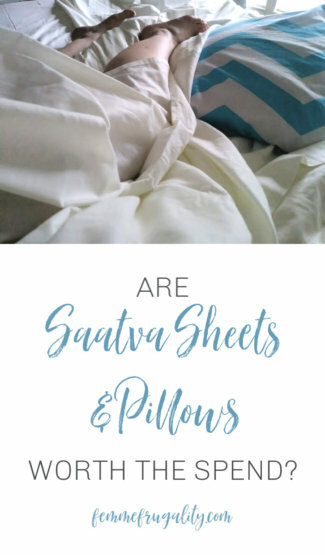 I was recently approached by Saatva–a brand that does bedding well. The do mattresses, pillows and sheets. 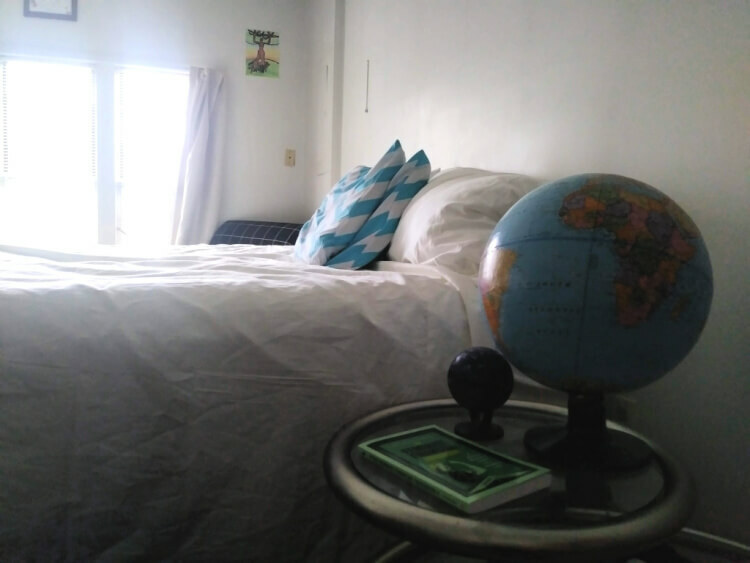 So when they asked if I’d like to try their 100% fair-trade cotton sheets, I of course said yes. Maybe this would be the solution to my problems! So far it has been. 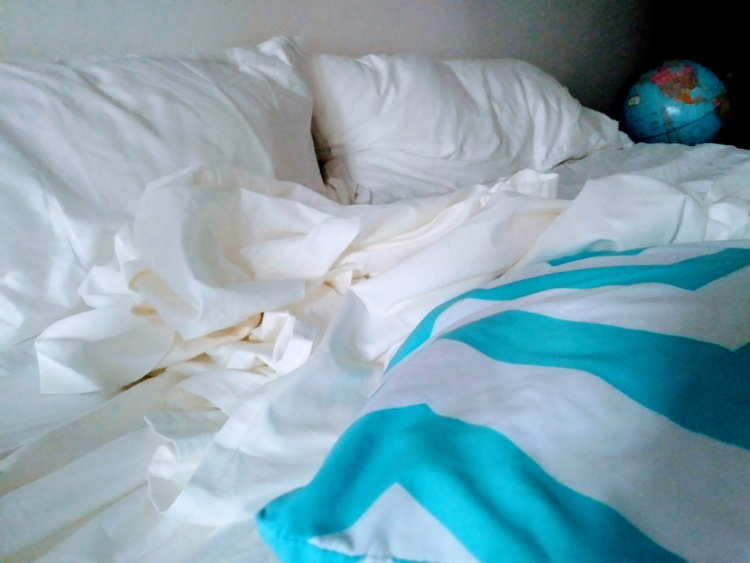 I’ve been sleeping on my new ivory, 300-thread-count, organic cotton sheets for over a month now, and not only are they 5,000 times more luxurious than their thrifty predecessors, but they’re also not ripped. They’re high enough quality that I don’t anticipate that happening ever, which is a nice change of pace. This is actually a purposeful act by Saatva. They make their sheets with long organic cotton fibers so they’re way more durable while remaining way more breathable. I’m also loving how good I feel about using them. They’re fair-trade. Global Organic Textile Standard certified. So what I’m sleeping in isn’t just good for my comfort. It’s good for the environment and all the people who take part in making these sheets a reality. I also have pillow problems. When I had my last child, they sat on a nerve that made it really difficult to walk. When I first woke up in the mornings, I couldn’t move anything from my hips down for tens of minutes. It was too painful. After my baby came into the world and I went through some serious physical therapy, I was mostly better. But if I sleep with anything but the pillow I’ve had for an embarrassing amount of years, my back still hurts in the morning. It’s enough to mess up my whole day. Guys, that pillow is gross. It’s been time for an upgrade for a while, but every pillow I’ve tried has left me regretting it in the morning. So when the good folks at Saatva said they’d send me pillows, too, I was more than keen on it. Maybe it would work. Maybe it wouldn’t. But it was worth a shot. Then I slept on these new pillows and realized they were the best ever. Better even than that one I should have gotten rid of years ago. The loft is a bit higher than what I’m used to, so I was a little concerned the first night. But it molded to my head, and I woke up in the morning with zero pain. Also, these pillows stay cold so you don’t even have to flip them. I’m not going to lie: The prices with Saatva are higher than those I found in the aisles of Walmart. But I don’t spend that much money on clothes, toothbrushes, concerts or even my beloved travel. So I’m going to spend money on Saatva bedding guilt-free. As I need future pillows, I’ll dole out the cash for a good night’s sleep. I’ll spend the extra money to ensure my sheets last more than a month, saving me money in the long-run. I’m a huge believer in value-based spending, and as this millennial gets older, I value my sleep more and more. 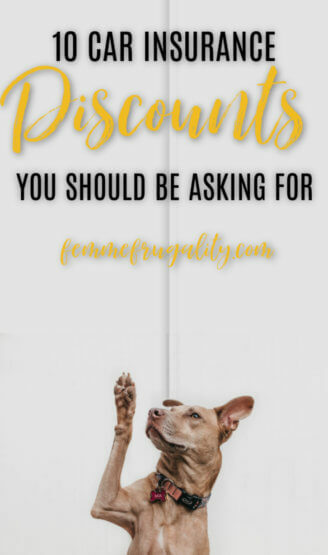 This entry was posted in Money Management on December 12, 2018 by femmefrugality. The following post is brought to you and contributed by an outside writer. play. Of course, I’m talking about buying a car and taking out a mortgage (not necessarily in that order). will open you up to the best deals and interest rates the next time you want that mortgage or new car, so it can make life’s challenges that little bit easier. Really, it’s not unusual to feel a little lost when it comes to your personal credit circumstances. will view you as more of a risk. This increased risk will usually result in a higher interest rate. more on the subject of bad credit by checking out the following bad credit car finance guide. will put you in a good position financially. Even simple things such as registering on the Electoral Roll and meeting your payments on time will help. Check out the infographic below for a visual representation and stay on the road to good credit in the UK.